I've shared with you all before how much my family and I love to relax with one another while watching a great family movie. Now, that it's Summer we've been doing more and more of this. Not only is this allowing us to spend quality time with each other, it's also allowing us to watch mutual shows and movies that we all love to enjoy. One of the ways that we do this is by watching Netflix! If you haven't subscribed to Netflix yet, you are totally missing out. Not only is this subscription affordable ($7.99 monthly), but there is literally something for everyone and loads of family movies that you and your little ones can enjoy together. Families with Netflix can enjoy their favorites, always without commercials, anytime, anywhere. Netflix works on a wide range of devices including smartphones, tablets, desktops, laptops, Smart TVs, Sony PlayStation, Microsoft Xbox and Nintendo Wii so there are plenty of options to watch your favorite movie or TV show! With family movies, like, Are We There Yet, James and the Giant Peach and cartoon shows like Curious George, Sonic Underground and many, many more, family movie night should be a must during the Summer. Another thing I love about Netflix is the fact that the first month is free. That's right, if you just want to try Netflix to see what the big fuss is about, you get the first month free and then can decide whether or not you'd like to continue your membership. I'm confident to say that I'm sure most of you would continue using Netflix after the first month, it's that good. And Netflix just keeps getting better. They now have a their new, Netflix Families menu that can be seen by subscribers and non-subscribers! How awesome is that?! With this new feature you don’t have to be a subscriber to Netflix before you can see what movies are available to subscribers. 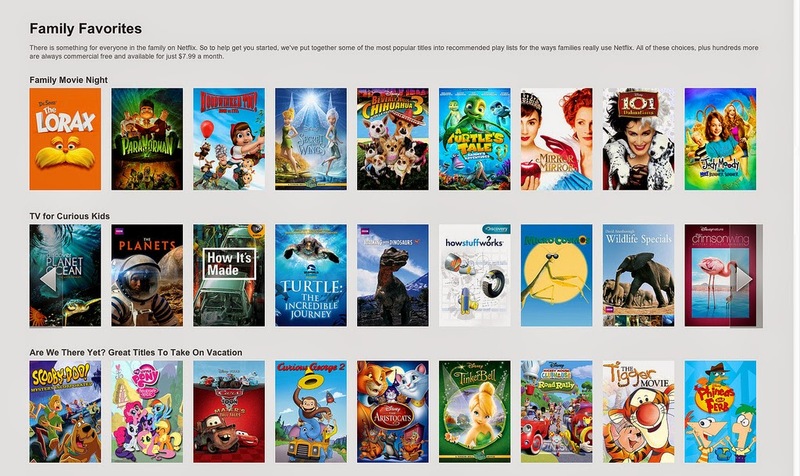 That way you can preview some of the movies they have to offer before you sign up for Netflix streaming. One of the ways we love to enjoy Netflix together as a family is during our movie nights. With tons of selections and new movies and television shows being added often, there is always something new to watch, so we're always having plenty of options and always trying to watch something new. Family movie nights are usually either on Fridays or Sundays in our house. We all cozy up on the couch, set the coffee table up with snacks and drinks for us to munch on during the movie and we turn on Netflix and just enjoy. The best part is the quality time it brings for my family and the amount of money I save. Instead of renting a movie for around $5.00 each, I get to sit on my comfy couch, save on gas and have tons of options for my family to enjoy. What's not to love? !